I don't need hibernate or suspend. I just want to be able to close the lid, and then open it and still have a working laptop. Is their a settings somewhere that will make Ubuntu ignore the lid closing? I solved this by changing to the closed source FLGRX driver. These settings are in System -> Preferences -> Power Management. Make sure there is no SD card inserted. http://ubuntuforums.org/showthread.php?t=1478787 has 120,000 views of 980 responses - it is still possible that one of the solutions will work for you. http://bugs.launchpad.net/bugs/585765 is about the most useful bug report, although https://bugs.launchpad.net/bugs/528981 worked for me (mainline kernel 2.6.34 solution). Not the answer you're looking for? Browse other questions tagged 10.04 laptop or ask your own question. 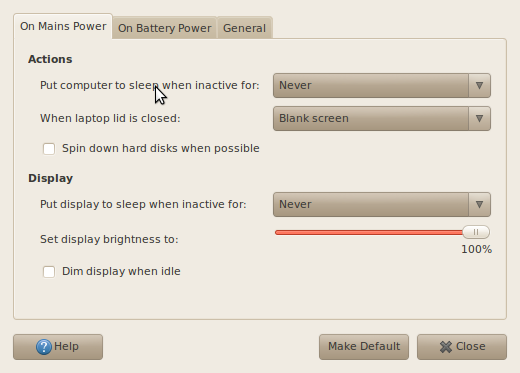 Is it safe to configure “Shutdown” on “When laptop lid is closed”?